When a new friend in Medium asks me for photographic advice I find it hard to respond. As an old obsolete-redundant and retired (soon to be a country song!) magazine photographer and journalist from an era in the 20th century when I was paid to go to many cities of the world It is difficult to give out advice without feeling smug. I will try not to be smug. In the mid 80s writer Les Wiseman and I (we both worked for a healthy Vancouver Magazine) decided to expand our horizons by going to New York City in search of work. We went to Rolling Stone, Esquire Magazine and Trowser Press. Only the latter ever gave us any paying work. The folks (at least the art director) at Rolling Stone had a telephone screening process. I was asked if I had any concert shots of rock bands. 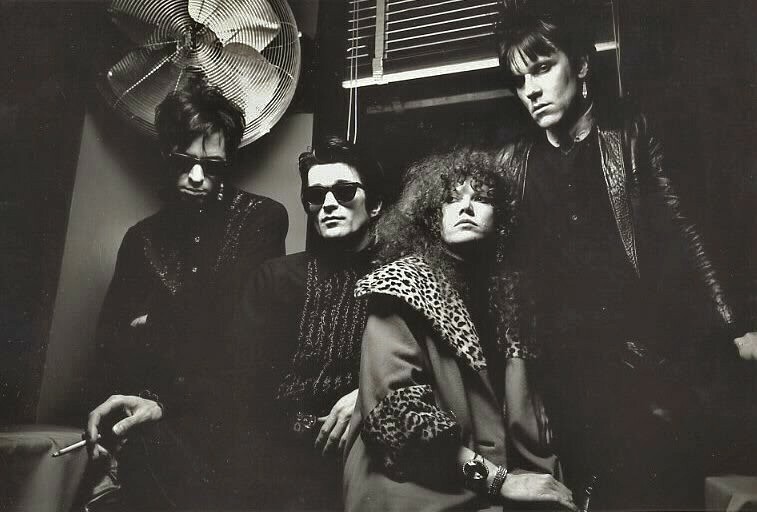 My negative answer passed muster and I saw the art director who told me, “Your photographs taken back stage and in hotel rooms are excellent but currently we are not interested in any Canadian bands and that includes Red Rider.” At Esquire we saw the now legendary editor Adam Moss. He told us he liked our work but added that both Joe Clark and Brian Mulroney were boring and he could not think of anything in Canada that would interest Esquire. And that was it and we returned to Vancouver. But what I learned from Rolling Stone I can pass here as advice. It may seem complicated but it is really not. The Holy Grail of photography for me is to develop a distinct personal style. This is tough if you shoot street scenes and bands in concerts. Your mike shot is not going to look any different from someone else’s. Street photography had style (it was unique then) when Cartier-Bresson pioneered it. Of present street photographers I can only cite that I admire(she is dead now) Mary Ellen Mark. If you attempt to shoot Ansel Adams landscapes it really has been done and done well. My advice to myself when I see a lovely landscape is to buy a postcard. I feel the same about that terrible photographic term “to record” as in “I am recording the fire plugs of the Bronx”. What I am driving at is that for me the search for that unique personal style found me in front of people whose portraits I took with a medium format camera and with seriously big lights. That has changed in that actors, rock stars, film directors no longer give access to photographers and writers in a physical environment. It now happens with phones, Skype, email or Whatsapp. Since I began professionally in 1975 I had the only option of film. I developed my own style of shooting my films of choice and I interpreted my b+w and colour negatives in my own darkroom. In the 20th century magazines demanded (before the advent of the scanner) slide film and larger slide film called transparency. An art director wanted to see the original which was the personal interpretation of the individual photographer. That aspect of photography is gone. My only advice would be to find something that nobody else is doing and do it. As for cameras the Nikon FM-2 always served me well. I own three. I also have a Pentax MX mated to a remarkable 20mm wide angle that is so rectilinear that used carefully nobody would suspect a wide angle has been used. A year ago my wife and I moved from a large house (with an excellent darkroom) to a small duplex without one. I have learned to use a Canon Pro-1 inkjet printer and with my Epson Perfection V700 Photo scanner I am able to get very good scans of all my film photographs and printed 8x10s. It was my wife Rosemary who “forced” me to buy a digital camera three years ago. I got very good advice at Leo’s Camera in Vancouver and purchased a Fuji X-E1. I have a safe sync adapter so I can use my studio lights with the camera. Its ability to shoot panoramics is a positive added asset. I just returned from a two-week trip to my hometown of Buenos Aires. The Fuji worked beautifully. I had an extra battery and charger. Every few days I would switch to a new storage card (just in case). My Photoshop is a 13 or 14 year-old one. It has the one feature I could not do without. It is called Shadow/Highlight. I use the more extensive option. It can bring detail (that has always been there) in my slides and negatives. For “fixing” some of my pictures I use the very cheap and excellent Corel Paint Shop Pro X2. Unlike most anybody else I shoot jpgs. A useful tool to accurate exposure is a good Minolta flash/exposure meter. I have two IIIs. A friend of mine has often said that one of the surest ways of improving a photograph is to use a tripod. Because m y workhorse is a Mamia RB-67 Pro SD a tripod is a necessity. When I use my Fuji I still use the tripod (in a studio situation) so I can carefully frame my shots. This cannot be done well if you shoot loose. Any photographer should remember that like a gunfighter one is as good as one’s last shot. The photograph in the beginning of this essay is an example of one of the few street shots I do. This only happens when I travel. 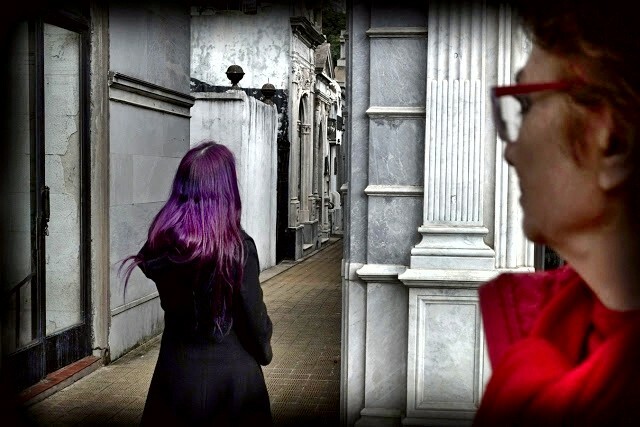 I was at the Buenos Aires cemetery of La Recoleta when I noticed this woman with the violet hair. 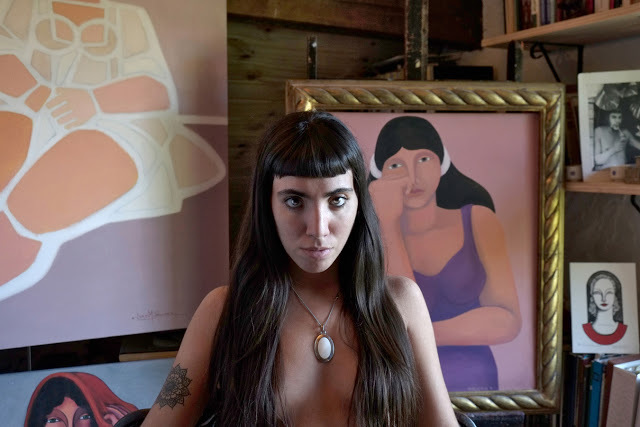 I was ready to shoot and when I pressed the shutter my Argentine painter friend Nora Patrich moved into the frame and “ruined it”. Once I saw the resulting exposure I realized that Patrich saved it!